Skin oils are a bit of love-hate relationship with me as I know they can have amazing benefits for the skin but so far the ones I have tried have just left my skin feeling greasy or worse break my skin out into spots which isn't ideal and can be darn right painful at times. My skin type is a combination so maybe that's a factor but I am sure you can understand why Im a bit dubious of them but intrigued at the same time to try facial oils. I never even knew about skin oils until a couple of years ago when I won one in a competition. It was then I read the benefits about them and also seen the market of how many they are available out there. Since then I have tried about 6 different facial oils and most I don't really like but you know I always have high hopes for every new brand and product I try. 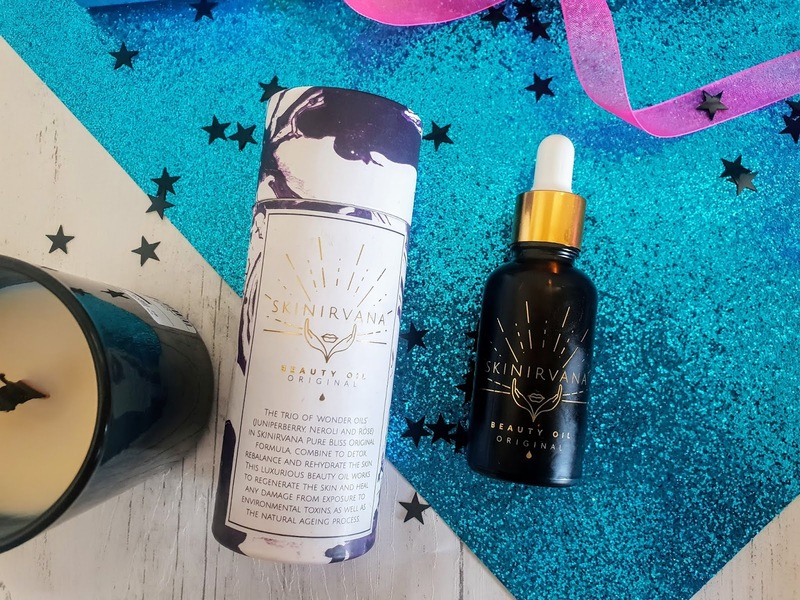 It was founded by the founder of Skinirvana because she wanted a product that would be gentle on the skin as she suffered from eczema and rosacea by using other skincare brands. So she wanted a product that was kind to the skin and was natural. Skinirvana has 2 different oils available; one is the original and one is delicate for people with more sensitive skin. What can I say.. its just stunning isn't it? It comes in a tube with a lovely design as you see in the photos. 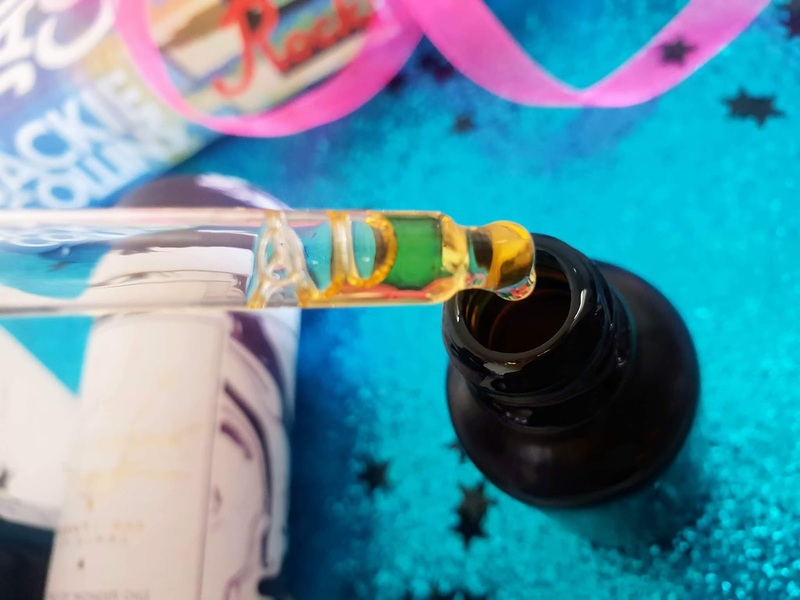 The bottle itself is very well made and the product itself looks like a high-end item and also very sturdy with its nice glass and drop applicator lid. The oil itself is very light and reminds me of the texture of my dr botanicals oils. It is very smooth but yet has a warming effect. This has a floral yet earthy scent too it. It has Juniperberry oil, Apricot oil, Rosehip oil, Sea Buckthorn oil, Neroli oil, Lavender oil and Geranium oil. As you can see by the ingredients it contrasts both earthy yet floral and my goodness it has to be the nicest smelling skincare product I have tried. Now that's the key question, right? Well, it is 100% natural, chemical free and its also cruelty. It has 95% organic ingredients and it is also vegan-friendly. The oils in this help to detox and to also rehydrate the skin. They also work together to regenerate the skin, help heal skin exposed to environmental exposure as well as the natural ageing process. You can use this up to twice a day with your moisturiser, once in the morning and once at nighttime if you wish. Simply apply a couple of drops of the oil in your hands then warm it up and apply to your neck and on your face. Applying upwards gently and avoiding the eye area ( only use eye skincare products as the eye area is very delicate). It works wonders and I am just chuffed. This has to be the first oil I have used that didn't break out my skin and makes my skin feel so soft and fresh. It has such a lovely floral scent that I have had people complimenting asking about it and I just can't help but mention this oil. I use this in the morning with my moisture and also at night time just before I go to bed. 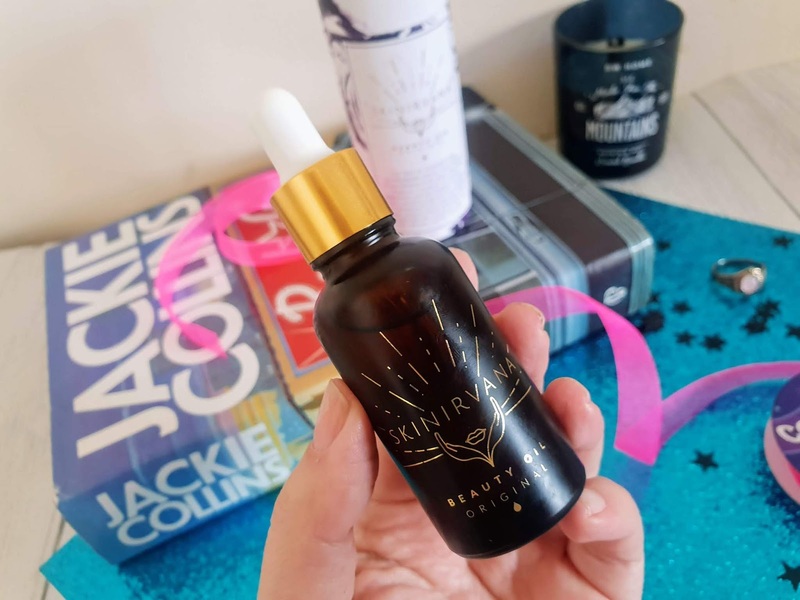 It does take a few minutes to soak into the skin but the wait is well worth it because it hydrates the skin and my goodness my skin does need that because it can get dehydrated and dry in parts sometimes, especially in the autumn and winter months. My combination skin can be sensitive at times but this didn't irritate it at all and now I can see the benefits of beauty oils. This is definitely my go-to beauty oil right now. 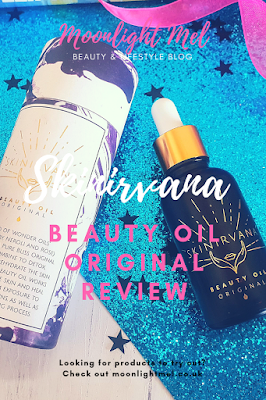 The Skinirvana Original Beauty Oil and Delicate Beauty Oil cost £45 each and are available on their website by clicking on the links. I bet this smells amazing! So many lovely ingredients. I have combination skin too and stayed away from oils for a long time, but actually my skin really benefits from them! I have a lot of trouble with floral smells. I have asthma and it really bothers me. I would love to find one I could use though. It was a great read. I love your review but only Aragon oil from herbalite suits me.